I was so glad I asked Eric about all his decorations and medals. I wasn’t sure if that was appropriate to do but he explained each one and I was duly impressed. 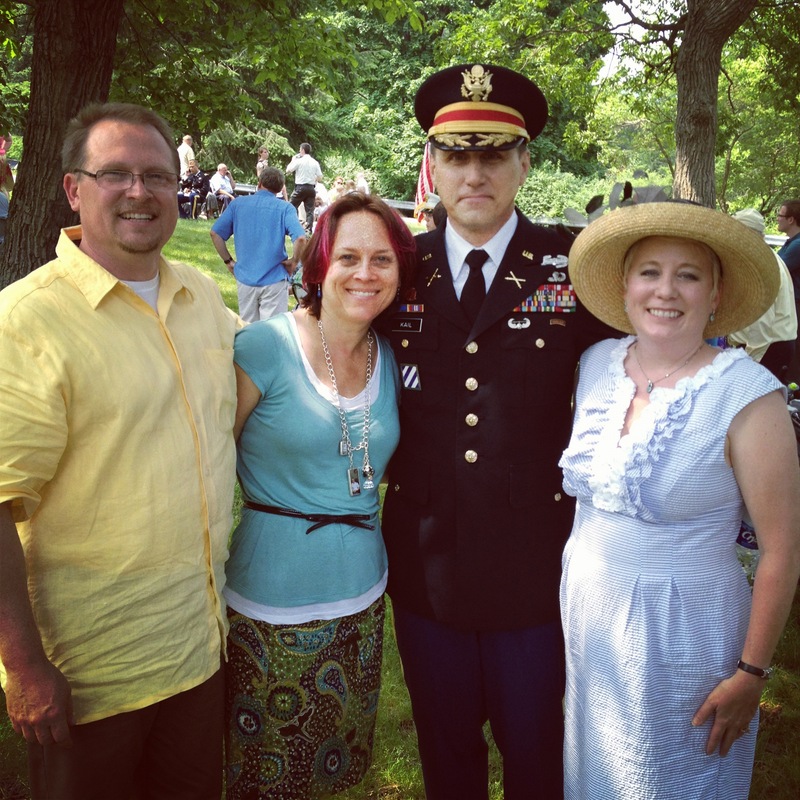 Today I want to celebrate a military man who greatly influences my oldest OS, the Hubs and me. Eric Kail and his family moved to North Carolina so he could pursue his PhD in organizational psychology at North Carolina State University. I first met his wife Gigi at a roller skating rink watching our kids go around the mindless oval. And when Gigi mentioned during lunch at Panera Bread that her dad had been the “Supe” at West Point, I’m pretty sure that didn’t faze me one way or the other. “Ok, so he was a ‘big wig’ at West Point, isn’t this salad delicious?” We just liked the Kail’s plain and simple. Fast forward a few years and upon successful completion of his studies at NC State, the Kail’s got stationed in Seoul, Korea for two years. We were sad and honestly didn’t think we would see them again this side of heaven. But God has an interesting way of bringing people together again and in the fall of 2007, our oldest OS suddenly declared his desire to go to West Point. Although they were in Korea and we were still in North Carolina, our lives began syncing back together. The words “West Point” that I had taken for granted now had great meaning. Why did they have to live so far away when we needed to talk and figure this thing out? Eric began to call us from Korea. He gave us insight and prepared us for the road ahead. The night he told us the brutal truth about Beast and R-Day, I distinctly remember collapsing on the carpet in our office. Nathan might be able to do West Point but I knew I couldn’t! Eric didn’t mince words about how hard it would be to say goodbye to our son but I also trusted his honesty and the confidence he had in all of us. 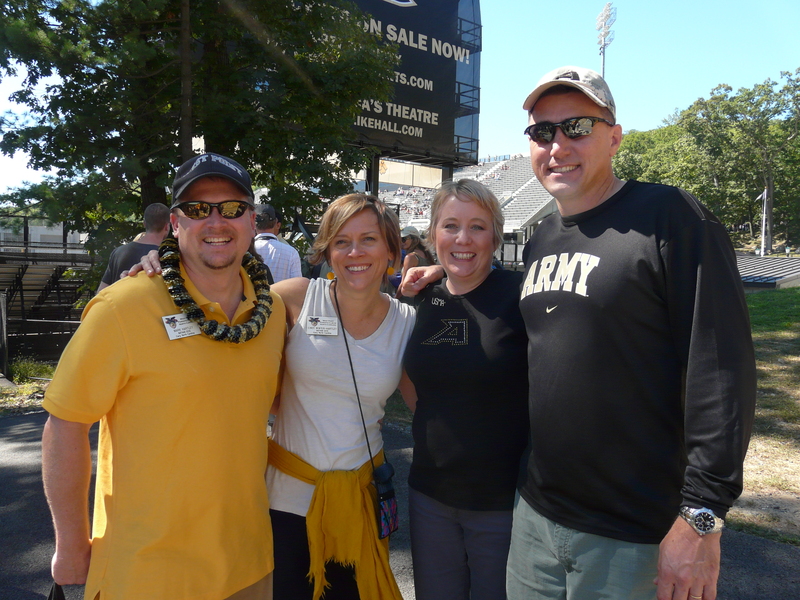 Even when Army loses, if you’re with the Kail’s, it’s a good time! The next thing you know Nate finishes his plebe year and the Kail’s get stationed at West Point! I never saw this coming! We stay with the Kail’s when we go to see our OS and our friendship is rekindled. Army football games, Ring Weekend, Nate has knee surgery in the fall of his firstie year and the Kail’s are to the rescue. Nate comes to rely on Colonel Kail’s wisdom and advice and does an occasional load of laundry at their house. Their hospitality is unmatched and we always feel at home in their midst. Most importantly so does Nate, it’s almost like they have a secret bond being Army men that we as civilian parents don’t and that’s perfectly fine. So when Nate was planning graduation from West Point, the choice was easy on whom he wanted to commission him as an officer. Colonel Kail of course. But now there was a big problem…cancer. In March, Eric was diagnosed with stage 4 transitional cell carcinoma. Stage 4 simply means that the cancer had spread to other parts of his body from the original source. Although nowhere near his vital organs, Eric started chemotherapy right away. Nate was crestfallen when I told him about Colonel Kail’s illness. I remember telling him the news while he was visiting his girlfriend in El Salvador, I felt Nate needed to know right away. My OS was incredulous and heartbroken, he took it very hard. In April, the Hubs had a business trip and arranged to stay at the Kail’s and hang out with Nate simultaneously. Fresh off of surgery, preparing for his chemo treatments, that’s when Nate asked his mentor if he would do him the honor of swearing him in as an officer in the Army. Without hesitation Eric said yes though we have learned that he has turned others down in the past. We waited and hoped it would be. 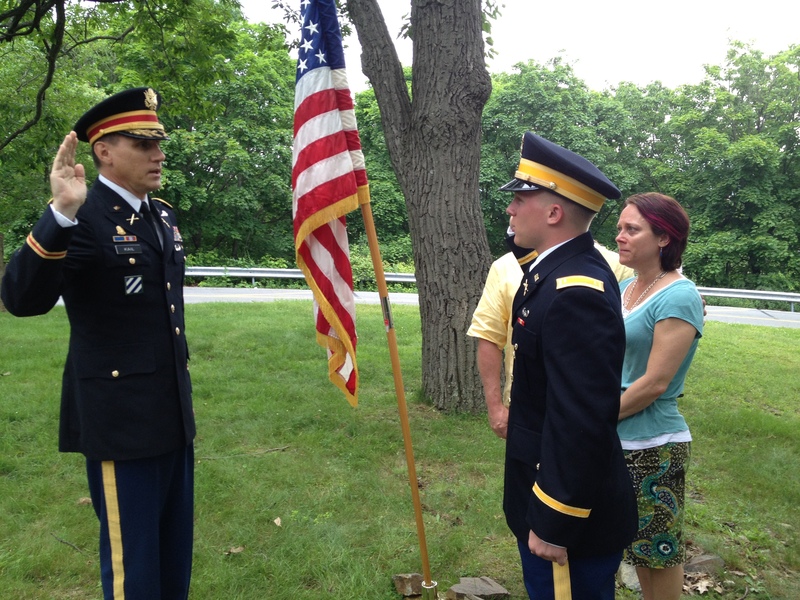 Colonel Kail and Nate during the oath ceremony. Um, yes, I was a little choked up. I love seeing the Hubs’ hands on my back offering support. So emotional! On a sultry afternoon just before a torrential rainstorm blew into the Hudson River, right outside the Cadet Chapel, Nate lifted his right hand. With the American flag in the background, our family, Gigi, Lu and her dad gathered around as Nate repeated the oath as instructed by the highly decorated Colonel Kail. The person Nate most wanted to perform this ceremony was there. Yes, as a result I had a horrible time trying to put Nate’s “butter bars” on his uniform. But God had arranged this day before the fullness of time. To see my OS being sworn in by his beloved mentor was a thing of beauty. When I think about how many pieces had to fall in place for this moment to have arrived, it astonishes me. The Lord had planned every detail and even orchestrated an “off” week for chemo treatments thereby allowing Eric to have the enough strength to do this. We serve a mighty God indeed. I underestimated Eric’s credentials! Wow! I’m not sure Eric has any idea what he means to my son and how much it meant to have him perform the oath ceremony. That’s why I’m writing this today. He deserves to hear it. So let me declare to all reading this Eric Kail has richly blessed my son! Let me further state Eric Kail has richly blessed my son not only as a man, but as a Soldier and a brother in Christ! And if I may, since I have the floor, let me proclaim this to the end of time We consider the Kail’s to be a gift from our Heavenly Father and are humbled to call them lifelong friends! Here are a few of Eric’s credentials…not too shabby. And you can read more about Eric’s leadership reflections in the Washington Post by clicking here and here. *In addition to being my friend, an awesome dad and husband to the smoking hot Gigi, Eric Kail is a Colonel in the United States Army. He has served for over 25 years as an Army Field Artillery Officer in both conventional and special operations units. He has several combat deployments, including Operations Desert Shield, Desert Storm, Enduring Freedom, and Iraqi Freedom. Eric also has a PhD in organizational psychology. 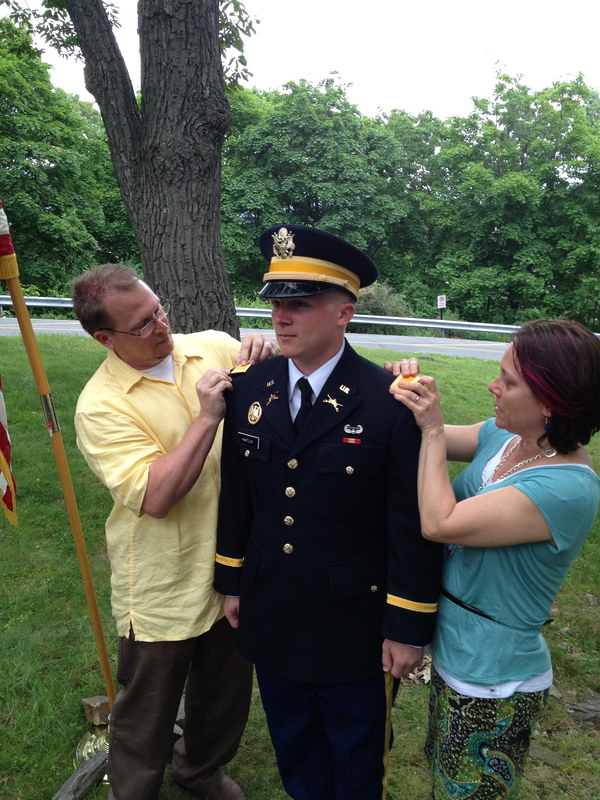 His latest assignment was as the course director for military leadership at West Point. 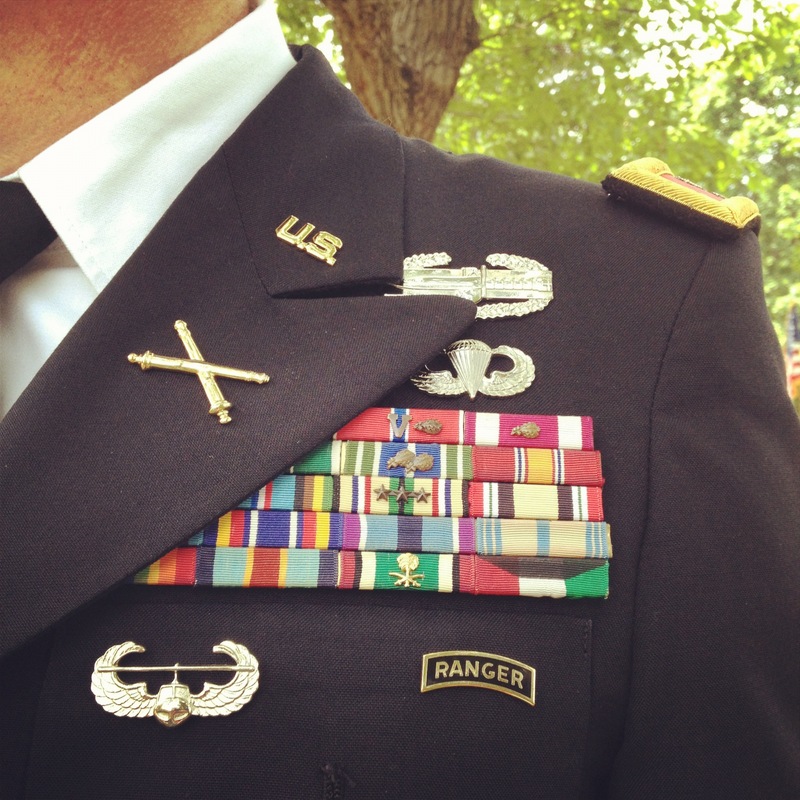 Check out this post for a incredible story about Colonel Kail. And update as of July 25, 2013: Our West Point grad, Nate wrote this beautiful tribute about Colonel Kail after Eric went to be with the Lord. Reading it will bless your heart. Thank you, I know he would appreciate it. Right now he is responding well to treatment and has a great outlook. The Lord is powerfully using this trial in many people’s lives! 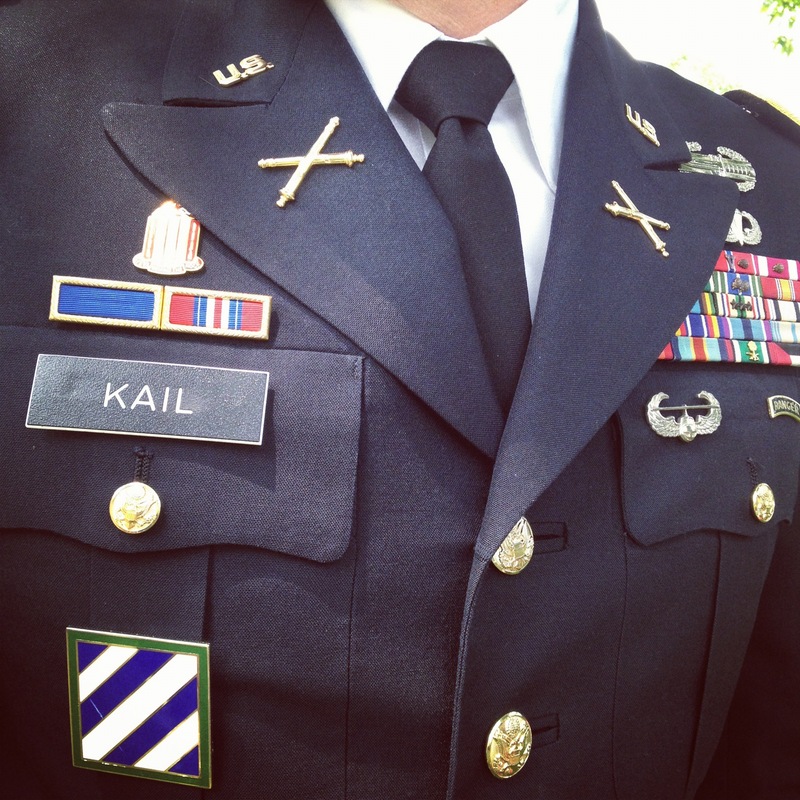 Another beautiful post, and a wonderful tribute to Colonel Kail. God is so good in the way he brings things together for us. We take the Washington Post, but I totally missed that series. I am going to bookmark that and share with Tim; what a great series of articles! Thanks for linking up to those, and for sharing these wonderful memories. Thanks Jenn. Eric has a wealth of stories and wisdom. He has done things most will never do and still is humble about it all. I hope you all enjoy the articles! I do not know you. I have tuned into your blog a few times from CCS Google Groups and always linger a bit because I enjoy your style of writing. I absolutely loved your tribute to Colonel Kail. I have such reverence for the military, and I cried reading about your good friend and Nate’s mentor. I will keep this vibrant man in my thoughts and prayers. A very special moment for all of you, for so many reasons. God Bless! Thank you Kelly! Eric is a wonderful man worthy of our prayers. Nate is a CCS graduate also. I had to write about how much we care for this man and his family. I have tried to leave a message here three times at least. Trying again today to say I love this story of God’s sovereign grace! Thank you for sharing it with us. I got it! Thanks for being so diligent! I’m still amazed at how the Lord intricately cared about all the details! It’s now a year later, and graduation is next week. It has been a long fight and we are hanging in there, hitting rough patches here and there. There are 5 special young men who have asked Eric to commission them this next weekend. Pray that he can do it. Thank you, Cindy, for a wonderful tribute. Love you much. I will be praying specifically for him to be able to commission those five guys. What an honor. It meant so much to us! Love you guys! I just think I might have to add you to my very short list of amazing bloggers!! This is a wonderful tribute to Eric Kail!! I have the honor of knowing Gigi’s brother, Colonel Greg Graves, his wife Wya and their daughters, one currently at WP! The Lord has done some intricate foot work to send them back to Florida where we can love on them and learn from them some more. I look forward to hearing more about Eric, Gigi and family when the Graves’ family arrives back in Tampa/St. Pete this summer! I can tell that the way the Lord has blessed you through the Kail family is HUGE!! My prayers are with the Kail family during this time of transition! God Bless You for sharing your heart with us! Susan, that sounds like a very special honor for me that I would gladly receive! The Army family is quite intricate as you say and it never ceases to amaze me how pieces and people got woven together in so many profound ways! Eric and Gigi mean the world to us and we praise the Lord for their influence on our son’s life! Stop by again, I’m blessed! It is a very fitting tribute and I pray that Eric will do well. God really puts special people in our lives. I am glad that Eric and Gigi have been part of mine! Thank you Terrie! The Kail’s are really special people that we never expected to bless us so much!